With the enormous success of the South Indian blockbuster, Robot (Endhiran) has already made a benchmark in the evolution process of filmmaking in India. The Rajinikanth – Aishwarya starrer directed by S.Shankar, got rave reviews for its uniqueness in action and visual effects. With a budget of over a hundred and fifty crores, 25 % of the funds were allotted in executing the commendable work done in VFX that helped in the narration of the film. The film revolves around Dr. Vaseegaran played by Rajinikanth who invents a High-end robot named Chitti, a mirror of his own image. The scientific body, AIRD, declines the approval of the robot stating that it does not have emotions and the ability to make rational judgment. An unexpected flash of lightning induces emotions in the robot, and Chitti is geared up for its integration into the human world. Chitti then falls in love with Dr. Vaseegaran’ fiancée Sana played by Aishwarya Rai and goes against his creator. The film has already spread its wings across the globe with raking in massive box-office collections. 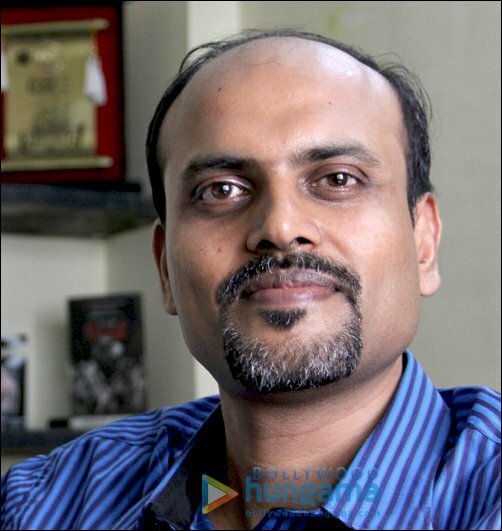 V. Srinivas Mohan, the VFX supervisor of this film and CEO of the VFX studio – Indian Artists, utilized the innovative skin grafting technology that got laudable appreciation from critics for Sivaji. Shankar got him on board for his latest endeavor Endhiran. He has also worked with the director in Aparichit and Boys hence it was certain that the director would need the VFX extraordinaire in executing the science-fiction film. Along with him Frankie Chung of Kinomotive studios and Eddy Wong of Menfond Electronics & Arts, both from Hong Kong, also worked as additional VFX supervisors for their respective sequences. Robot boasts of a mammoth 2000 visual effects shots in 40 scenes. The bulk of the VFX work was undertaken in Srinivas’ Indian Artists Computer Graphics Pvt. Ltd., Kinomotive Studios, Menfond Electronics & Arts, Pixion, Vensat, Firefly Creative Studios Hyderabad, EFX Prasad Studios, Oyster and Ocher studios also assisted in executing some of the VFX and post production work for the film. Apart from the studios that were on board in this project, talented freelancers from London, Iran, Germany, France and Hong Kong were required for their expertise. In this exclusive two part case study, BollywoodHungama gets to the bottom of the making and visual effects process that made this monumental film and Rajinikanth shine like steel. Shankar the director called up Srinivas in the winter of 2007 and narrated the entire story to him for over four hours. Amazed and excited about the project since nothing of this nature was undertaken by any filmmaker in India before. The conceptualization and ideation was done entirely by the director. Following the preparations of the script, Srinivas explained to the director that pre-production and planning was needed to execute his ideas before production of the film began. When Srinivas, the VFX supervisor, understood the script, a test was carried out to get a glimpse of the scene with visual effects. The director and Srinivas chose the train sequence for the test. With the shot divisions regarding the different camera angles in place during pre-production, an animator Sanath P.C. from Hyderabad was roped in to enhance the pre-visualization process. Maya, an academy award winning software was used to create a digital set based on the script. Layouts of the train and characters were made using the software, although the team didn’t finalize any locations during the test, they used actual physical proportions of a real train. Once the director approved of the layouts, basic actions of the scene were carried out. Srinivas along with the director and the director of photography blocked the camera angles for the scene using the software. Each shot had 2 to 3 versions of camera angles made to get a better view of the sequence. With the digital shots in place, temporary clips better known as ‘playblasts’ were extracted from the software to view the shots they made in real time. With these clips in hand, Anthony – the editor, was required to line up these clips according to the scene. This gave the team some room in improvising the shots that were made. Utilizing this method, the team planned out 40 crucial visual effects scenes of the film. Shankar did the shot division of the script which he handed over to the supervisor for pre-visualization. With the pre-visualization sorted out, Srinivas who headed the visual effects team did the entire VFX breakdown of the film. With this the team had more clarity in terms of execution and knowledge of the different layers that consisted of live action, CGI and animatronics. Based on the breakdown, Srinivas started hunting for appropriate artists and talent they needed for the film. The D.O.P, R.Rathnavelu was instrumental in the pre-production stage; he helped Srinivas and the director in blocking the different camera angles that were required. This clarified what was needed in all the different layers involved in the shots. With his tremendous knowledge in visual effects, Rathnavelu pointed out the constraints in executing the shots in terms of lighting and other technicalities. The opening shot of the film where-in the robot gets assembled and the credits of the film are rolling weren’t decided in the script initially. Instead of the animation sequence seen in the film, the makers had initially thought of using live action for the introduction sequence. This didn’t go well for an opening shot. With this in mind, Srinivas consulted the director and suggested using an animation of the robot getting assembled in the scene. He points out that this was a last minute decision which worked in their favor. Pre-visualization and implementation of the animation was done in a week. Pixion in Chennai did the opening credits and animation for the opening scene. Animatronics is mostly used in filmmaking and other avenues of entertainment. It is basically electronic puppetry that simulates real life in front of a camera. This technology is used in a large number of films in the west. 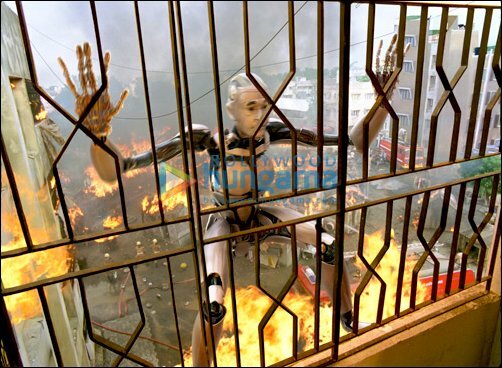 Srinivas insisted in using this unique innovation for Robot based on the visual effects break down that was made for the film. He approached Legacy Effects formerly known as Stan Winston Studios in LA, to assist in the making of the film. The American studio worked in movies like Terminator: Salvation, Avatar, Alice In Wonderland etc. Srinivas points out that they utilized electronic puppetry in place of the actor for its realism. The scene where Rajinikanth places the eye on the robot was all executed by Legacy Effects. They also assisted in special make up that was required for Rajinikanth. From whipping up recipes to giving nuskas, cookery shows have done it all. But there’s something different cooking here! Star Plus is set to take cooking beyond the four walls of the kitchen with MasterChef India, a show that will be judged by none other than Bollywood star Akshay Kumar along with two other chefs, Kunal Kapoor and Ajay Chopra. After breaking rating records in UK and Australia, MasterChef is coming to Indian television for the first time. The show, slated to begin on October 16 at 9 pm, will see 12 contestants from all walks of life with a flair for cooking being subjected to intense pressure and real life challenges. From cooking for huge crowds with minimum equipment to whipping up recipes at a moment’s notice, the show will pose every cooking challenge within your imagination! Akshay’s all set for television once again, ready to reach viewers through their stomachs this time. At a press conference held to announce the show, he regaled everyone with an Indian adaptation of the internationally-acclaimed group Storm’s performance. “I am very happy to be returning to my roots after so many years,” he smiled. “My two favourites — cooking and camera/entertainment are coming together and I’m excited to be a part of it. I have been following the international version of this show regularly and I’m glad that Star Plus is bringing this great and interesting challenge to the Indian audience,” said the Khiladi No.1. On Tuesday evening Katrina attended the worst press conference of her life, where a session organised for one of the brands the actress endorses turned out to be a free-for-all grueling barrage of questions about her split with Salman Khan. At first Katrina took it in her stride and tried to smile through most of the questions. But soon, completely unnerved by the jibes and comments from the members of the press, Katrina lost all control over her emotions and blurted, “If Salman says we’ve split, it must be true.” She walked out of press conference soon after. But this wasn’t before she actually bawled in front of everyone. Elaborating on why Katrina is so angry, her friend added, “Firstly, it was unfair of Salman to speak about their so-called split; they had decided between themselves that they would never talk in public about what transpired between them. When asked about the events at the press conference on Tuesday evening, Katrina admitted it shook her up and said, “What happened was very, very disturbing. I had the entire congregation of media persons questioning me about a statement made by Salman. After this incident, Katrina has decided to add a few amendments to her contract that will ensure that she is asked questions only related to the brand she has chosen to endorse. We hear you Katz, loud and clear. Ahem, actually we don’t. Dressed in a wispy Stella McCartney dress, relaxed at home surrounded by family and dog, Kangna Ranaut basks in the success of her latest film. With her legs folded under her, she looks like a little girl but comes to life and is all-woman when our photographer enters the room. That’s typically her, an actress who can change mood and look in seconds as she talks about her life and where she sees it going. • Could you ever submit yourself and your career totally to one man the way your character did in Once Upon A Time in Mumbaai? Gosh no, the thought is scary. Thank God we don’t live in those times when we could be told that if we did or didn’t do something we would be shot. I am very happy to be living in the times I do when things are cool and we can date whoever we want to without fear of repercussions. I am in Mumbai because here I have freedom. If I have to be told what to do I would rather live in Manali, with its social pressures. • So much of freedom and you aren’t even dating? Trust me I am exercising my freedom but because I am surrounded only by married guys, I don’t get a chance to go on dates. Freedom is not about walking into a club and saying hey, I’m single. I always say that I am late by 10 years in the industry because all our best heroes, directors and producers who I deal with daily are married and have children. Unfortunately, I never meet any businessman, investment banker or engineer, and even if I do all they want is an autograph. Yeah, it is sad at times. I am young and all my friends are dating or getting married but I have been exceptionally unlucky with love. None of my relationships have really worked. A lot of my friends have been in love for 10 years and are now getting married. But I didn’t meet any guy in school; I grew up and just randomly dated. That’s why I say I have been exceptionally unlucky. Today, I am totally open to somebody match-making for me. • What have your characters taught you about yourself? It is weird that whatever I have learnt about myself, my life or other people, it has been through my work. I am not well educated. And though I read a lot even more than that I observe people, see their expressions and emotions and every script and every story tells me so much about life and people. During Gangster itself I realised that I am exceptionally talented. So now I don’t underestimate myself. The other thing I have learnt about myself is that there are many sides to me. I can be extremely aggressive and I can be extremely tender. And because I have been subjected to the most difficult circumstances at a very young age, I tend to behave like a man most of the time. When I meet a man I act so much like him that I evoke more competition than desire in him. But when I emote romance, a very soft and feminine side to me emerges. There is one thing about the film industry that hurts me very much. And that is that the industry on the whole is very partial to its own people. I know that if Gangster had flopped, then, despite my performance, I would have never been given another chance. But I am God’s favoured child so no one can do anything about it. I have a success percentage of 99 per cent which sometimes surprises me too. Actors who belong to the industry are given chance upon chance till they make it, which is ok, but when there is an exceptional talent, the industry should be kinder to them. It should not be all about babalog and babylog. There is no doubt that our work is given not only less appreciation but also less respect. Otherwise why would I have been jobless for a year between Life in A Metro and Fashion? • You were not offered any roles? I was offered roles but they were all B-grade or C-grade films. Today people are very kind but I remember a time when they would do everything to keep me out of the big league. • And are you being selective now? No. I don’t want to only have two films a year. I am in the process of experimentation. I will keep doing comedy, thriller, dancing singing roles, intense characters and romantic love stories so that by the middle of 2012 or so I will know my forte. I am probably the actress working on the maximum films. I have seven releases coming up and am working on five films. If I have signed 15 films, you can figure that I must have been offered at least 25. • What are your securities and insecurities at this point? My biggest security is my talent, my passion, my enthusiasm. My inspiration comes from within and I totally ignore people who are negative. When I am low and my father tries to be supportive and says, “You don’t need to do this. Why are you crying and feeling bad? Don’t forget we have a beautiful house, we can go back to it” I am like, “Can you please go from here?” Whenever I am upset my inspiration comes from within. My spirit is all I have. Like any other person I feel extremely insecure, sometimes. Today I am on my way to doing things that will take me to my goal, the things that will make me happy and feel complete. But my biggest fear is that what if I get there and then don’t get that feeling? What if I feel this is not what I should have done. Is this the meaning that everyone is looking for in life? That really scares me. Normally Priyanka Chopra is not the kind of girl who displays emotions, not even in front of her own family. But on the night of 16 July when her parents threw a small pre-birthday party at home for her and her close friends, Priyanka for the first time cried openly. It was not the well-organized party where her mother cooked her favourite Punjabi dishes. It was the gift that her parents bought her, a 6-carat diamond ring, which made Priyanka bawl like a baby. Says a close friend who was at the get-together. “The minute she saw the gift Priyanka burst into tears. We were shocked because we had never seen her like that.” Apparently, Priyanka proudly wore the ring to her beachside holiday although her parents warned her she might drop it in the water. Priyanka’s brother Siddharth who celebrates his birthday a week before his sister kept teasing her about hiding the ring before she left. Incidentally, Priyanka had arranged a surprise birthday party at China House at the Grand Hyatt for her brother. Akshay Kumar and Priyadarshan have cooked up a hilarious plot once again, but this time, it’s a little Khatta Meetha. The famed director who has made blockbusters like Hera Pheri, Bhagam Bhag and Bhool Bhulaiya with Akshay, is presenting the actor as Sachin Tichkule in the film that’s produced by Cape of Good Films Private Limited and Shree Ashtavinayak Cine Vision Ltd.
Khatta Meetha is about a struggling construction contractor Sachin Tichkule with big dreams who lacks resources to realise them. He is the black sheep of the family unlike his brother, who is hugely successful albeit by using incorrect means. And when a new commissioner takes over the municipal office, Tichkule’s woes further increase. RK Laxman, will get you thinking and have you laughing off your seat at the same time. And like all my other films, this one too comes straight from the heart.” Priyadarshan couldn’t agree less. “Sachin is the most intricate character I’ve ever dealt with and Akshay has indeed put his heart and soul to bring the character to it’s zenith. His body language, emotions, dialogue delivery and comic timing has all been done with enough realism and subtlety,” said the director and added, “Akshay scored in his role perhaps because he he life the life of an ordinary man before becoming a star. I’ve seen Akshay grow from Hera Pheri to Khatta Meetha, and I can proudly say that he’s on par with any actor you can compare with today.” Debuting alongside the Bollywood’s box office king, is one of South’s most sought-after actresses — Trisha and the music of the film has been composed by Pritam. SHAH Rukh Khan’s performance in My Name Is Khan has brought him to a new level of self-realisation as an actor. Speaking candidly on the yearlong sabbatical in 2006, Shah Rukh says he has been able to sharpen his skills as an actor while recovering from his back and shoulder injury and surgery. Riteish Deshmukh, another favourite of the maverick filmmaker, has done three films with RGV but thinks Rann is his full-fledged outing. “In Naach I had an extended guest appearance while in Darna Zaroori Hai, it was just a few minutes’ role for a short story. This is my first meaty film with Ramuji,” said the actor expectantly waiting for reviews of his performance from the box-office, critics and fans. In a first for a Hindi serial, Yeh Rishta Kya Kehlata Hai will air a silent episode later this week to do justice to the trials and tribulations its characters are facing. To highlight the gravity of the scenario, a unique background score will be used to add intensity to the situation in the Singhania household. Hina Khan, who plays the lead character Akshara, is shown as the most pained of the lot as her family blames her for instigating a relationship between Mohit and Nandini, played by Ayush Agarwal and Niddhi Uttam. The freedom from heavy dialogue was welcomed with much relief by the cast, even though it was only for one episode. “It was good in a way, not having to learn the dialogue by rote,” Hina laughs.